I have a problem on fragmentation which requires mechanisms involving formation of an enamine from a cyclic ketone and cyclic secondary amine. This then reacts with a cyclic aldehyde via conjugate addition, but the intermediate cannot be reached. I've been told that I have to exchange the enamine of the ketone with the enamine of the aldehyde. What does this mean? 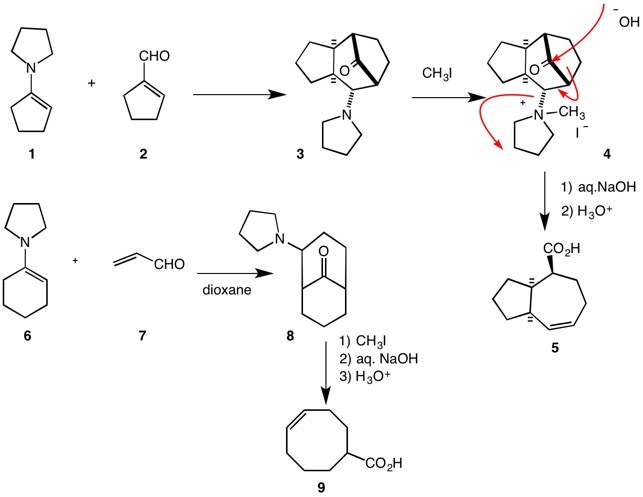 Give mechanisms for these reactions, commenting on the fragmentation. Revision of conjugate addition of enols, another ring expansion with an enolate as leaving group and an interesting piece of stereochemistry. The first step is enamine formation and the second is conjugate addition. This appears to lead to a dead end as we cannot find a way to make the intermediate from the product. @Laura: Both Waylander and Zhe are correct in their respective comments. Your example is from the work of Hendrickson and Boeckman.1 Enamine 1 and conjugated aldehyde 2 were mixed neat forming bridged aminoketone 3. At some point, as Zhe has intimated, exchange of pyrrolidine from the ketone to the aldehyde must occur before cyclization to 3 can be accomplished. The usual explanation is that traces of water are present to catalyze the reaction. Quaternization of the amino group in 3 affords the salt 4 which cleaves with hydroxide via a Grob-like fragmentation to 5. Note the important anti arrangement of the dotted bond and the proximate vicinal bold bond. The product contains a double bond as Waylander has stated. The first example of this reaction, 6 --> 9, was reported by Stork and Landesman2 in 1956. 1) J. B. Hendrickson and R. K. Boeckman, Jr., J. Am. Chem. Soc., 1971, 93, 1307. 2) G. Stork and H. K. Landesman, J. Am. Chem. Soc., 1956, 78, 5129.